Global . feast day of Passover commemorates when the Angel of the Lord passed over the homes of thoseand astronomical alignment of Stonehenge, the Great Pyramid, Bethlehem, the Crucifixion and the Crucifixion moonrise. At Stonehenge on the day of the Crucifixion the moonrise azimuth and the great circle route to the site of the Crucifixion formed the Christ Angle, the Christ Angle is the angle of the Great Pyramid’s sloping passages. One diagonal of Stonehenge’s Station Stone Rectangle is on the azimuth of a great circle that passes through the Great Pyramid, so the 9123.84 inch perimeter Station Stone Rectangle is connected to the Great Pyramid’s 9123.84 inch x 9123.84 inch full design base by a 9123.84 megalithic mile circumference great circle of the earth. 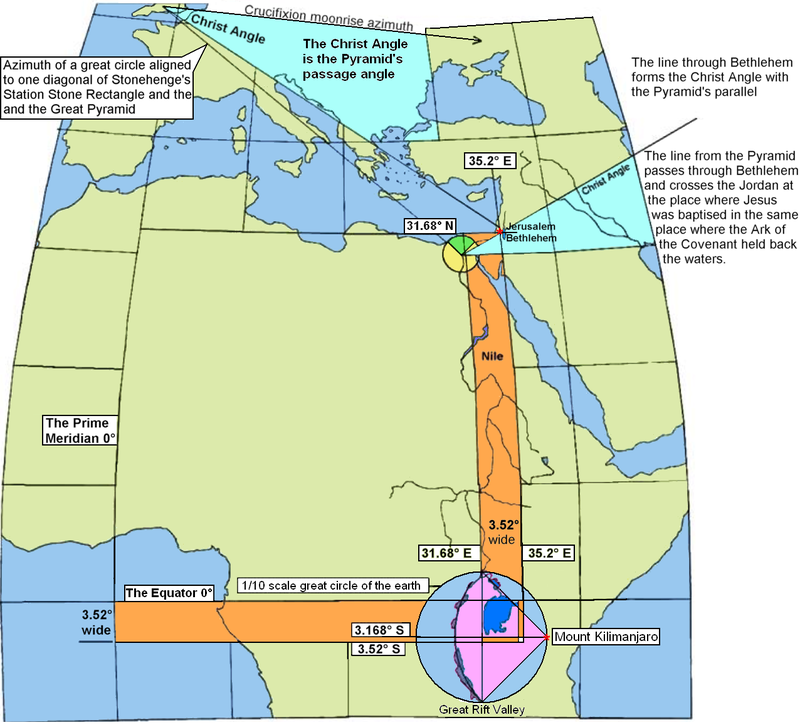 A rhumb line from the Pyramid to Bethlehem forms the Christ Angle with the Pyramid’s latitude (the world’s longest land parallel) and the distance on a great circle route equals one Pyramid furlong for every year counting from the Pyramid’s datum year to the birth of Jesus. We need a 31680 foot bridge to join Bethlehem to Jerusalem and complete a circuit with Stonehenge, the bridge is the life of the Lord Jesus Christ from his birthplace to the Crucifixion (31680 feet) on the feast day of Passover, the rituals of Passover prophesied of the Crucifixion. The extra line of the circuit points to the Passover moonrise on the day of the Crucifixion which was appropriately eclipsed this can only occur on a full moon and the feast day of Passover was always held on a full moon. Stonehenge’s Outer Bank has a 380.16 feet diameter symbolizing the moon’s 3801600 yard diameter and the 31680 feet from Bethlehem to Jerusalem = 380160 inches and also symbolizes the Passover Moon’s diameter, and 380160 yards is the diameter of the 1/10th scale model great circle of the moon around the Great Pyramid. Great crowds gather at Stonehenge on the day of the summer solstice (midsummer’s day) when on this latitude the azimuths of the sunrise and the moonrise form right angles and the sides of the Station Stone Rectangle are aligned to them, this astronomical event is incorporated into Stonehenge’s design and dictates on which parallel the monument had to be built. The monuments exact position on this parallel is dictated by the great circle route to the Great Pyramid described above which is aligned to one diagonal of the Station Stone Rectangle, so the global position of Stonehenge is dictated by a combination of astronomical design and the global position of the Pyramid. Also Stonehenge’s global position is fixed to the Passover moonrise on the day of the Crucifixion in combination with the global position of the Crucifixion site, the moonrise azimuth and the great circle route to the Crucifixion site formed the Christ Angle (Pyramid passage angle) at Stonehenge. 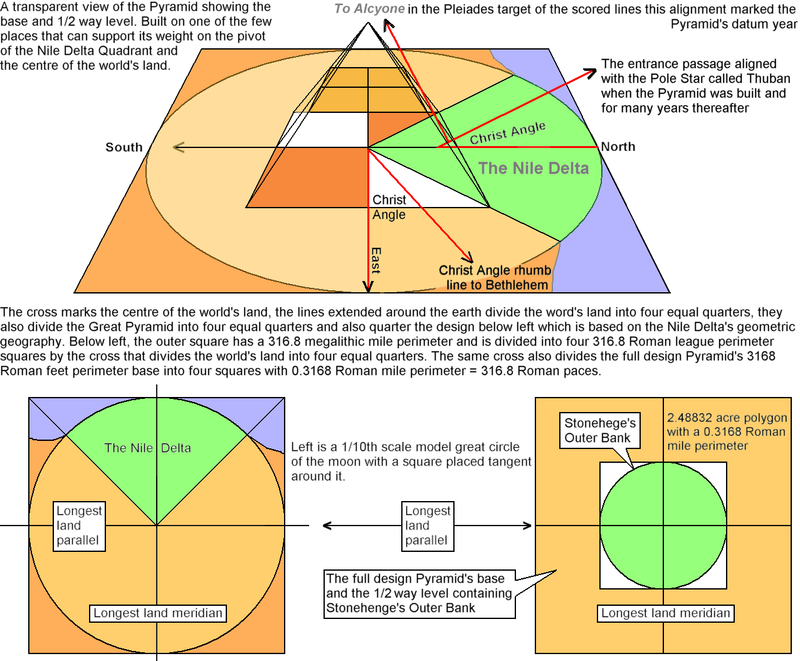 The Christ Angle was formed by aligning the Pyramid’s entrance passage to what was then the pole star, so the Christ Angle is a product the global position of the Great Pyramid and the global position of the Pyramid is fixed to a lot of important things like the centre of the world’s land and the pivot point of the Nile Delta Quadrant to name just two things. 2139 years before Jesus was born the star Alcyone in the Pleiades aligned with the scored lines in the Pyramid’s entrance passage it marked the datum year of the Pyramid’s internal prophetic design which is on the scale of 1 Pyramid inch to a year measured from the Scored Lines on the floor line of the passages. Measuring back from the Scored Lines to the entrance informs us of the year when construction of the Pyramid commenced, if we measure in from the scored lines a distance of 2139 Pyramid inches the internal design indicates the year of Jesus’ birth, the distance from the Pyramid to Bethlehem is 2139 Pyramid furlongs on a great circle and a rhumb line from the Pyramid to Bethlehem forms the Christ Angle with the Pyramid’s parallel, so adding 1 year per Pyramid furlong from the Pyramid and its datum year we reach Bethlehem on the date Jesus was born. 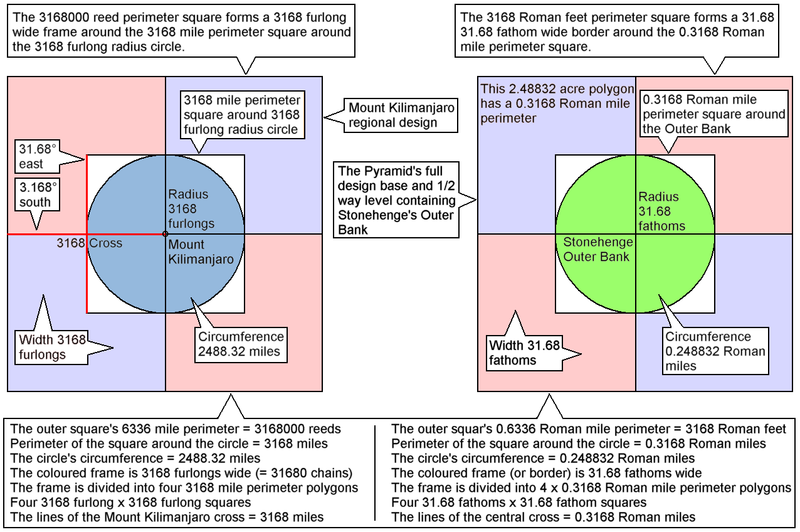 Stonehenge’s Outer Bank has a diameter of 0.0792 Roman miles and a circumference of 0.248832 Roman miles and a square placed tangent around the Outer Bank records the equator’s rotation speed per second which was 0.3168 Roman miles, these details symbolize that the earth’s 7920 mile diameter x 864/275 = 24883.2 miles circumference and a square fitted tangent around the earth has a 31680 mile perimeter. We have placed Stonehenge’s Outer Bank on the Pyramid’s half way level because it fits perfectly (and for other reasons). The 3168 Roman feet perimeter base forms a 31.68 fathom wide frame = 3168 Roman digits around the 0.3168 Roman mile perimeter = 316.8 Roman paces half way level, the frame is divided into four polygons, each polygon is 2.48832 acres and has a 0.3168 Roman mile perimeter which records the equatorial rotation speed per second and also symbolizes a 31680 mile perimeter square around the earth’s 24883.2 mile circumference. The half way level is divided into four 9123.84 inch (= 3168 Roman palms) perimeter squares, this refers to the 9123.84 megalithic miles in the earth’s circumference with a 31680 mile perimeter square fitted tangent around the earth. A Roman foot = 12 Roman inches and/or 16 Roman digits; the Roman palm was 3 Roman inches; 5 Roman feet = 1 Roman pace; 1000 Roman paces = 1 Roman mile; 5000 Roman feet = 1 Roman mile; the Roman league was 1.5 Roman miles. All these details are fairly well agreed upon though some people assume the Roman league was 3 Roman miles which is understandable because there were many versions of a league used in different countries in Europe and they usually represented three of the nations miles. There was also different versions of the Roman mile and foot etc. used throughout history and we use the Roman mile of 1600 British yards defined by Noah Webster, although there is confusion these days about the length of the Roman mile this confusion did not exist when Noah Webster did his research or he would have mentioned it. Stonehenge, the Great Pyramid and the Mount Kilimanjaro regional design. The centre of the outer square (below) is on Mount Kilimanjaro and it is the smallest square in that alignment that can contain the regional design, 3168 x 31680 inches produces 1584 miles which is one side of the square and its perimeter is 3168000 reeds = 6336 miles. The outer square forms a 3168 furlong wide border around the 3168 mile perimeter square around Mount Kilimanjaro, the two lines of the big cross = 3168 miles and divide the area between the squares just mentioned into four 3168 mile perimeter polygons and the inner 3168 perimeter square is divided into four squares measuring 3168 furlongs x 3168 furlongs. Below right, we have placed Stonehenge’s Outer Bank on the full design Great Pyramid’s ½ way level, we have done this before to demonstrate how the designs of the monuments interface, now we compare these design features of the monuments to the Mount Kilimanjaro regional design to reveal many simple and intricate design parallels. A 31680 mile perimeter square fits tangent around the earth’s 24883.2 mile circumference, these things are symbolized by the four 2.48832 acre polygons with 0.3168 Roman mile perimeters in the Pyramid’s base, the same thing is also symbolized in a more obvious manner by the 0.3168 Roman mile perimeter square around Stonehenge’s 0.24883.2 Roman mile circumference. And as you know by now the Mount Kilimanjaro regional design contains a 1/10th scale model of a square placed tangent around the earth. The two lines of the cross inside Stonehenge’s Outer Bank = 9123.84 inches, they divide the 0.3168 Roman mile = 18247.68 inches perimeter square into four 0.82944 acre squares with 9123.84 inch perimeters, the two lines of the cross and the four lines of the square around it = 27371.52 inches. These details refer to the earth’s circumference (via the 864/275 method for π) which is 24883.2 miles = 8294.4 leagues = 9123.84 megalithic miles = 18247.68 Roman leagues = 27371.52 Roman miles and when this was the equator’s circumference (before the bulge) turning at 0.3168 Roman miles per second (= 18247.68 inches) = 18247.68 Roman leagues per day. Noah Webster in his 1828 Dictionary defined the Roman mile as 1600 yards and this is the version used throughout this investigation, other versions of the Roman mile existed, but we use this version of the Roman mile because it was used in the Great Design and the monuments designs.